I have been just as guilty as many photographers when it comes to not reading camera manuals and books. After all, when you first get that new digital camera or accessory, you want to start playing with it right away. Who wants to waste time reading about it when you can push buttons, turn dials and snap pictures, right? I am no different. I want to open up the package and start playing with my new toy. We all like the fun experience of exploring our most recent acquisition just like a child who opens a package at Christmas. Some of the t3i books come as printed versions as well as Kindle and Nook eBook versions. The virtues of an eBook versus a printed book is an in-depth discussion for another day. The better books are usually written by real photographers, not technicians. It should be easy to understand and be oriented to your specific skill level. It is often useful for advanced users to occasional review basic skills, but if it is too basic, the book will have very little value for you. It should also provide a few tips that are unique or new, not found in the traditional cut and dried manual. Information that starts with what you are trying to photograph and then clearly shows you how to set the camera for the best shot is useful. 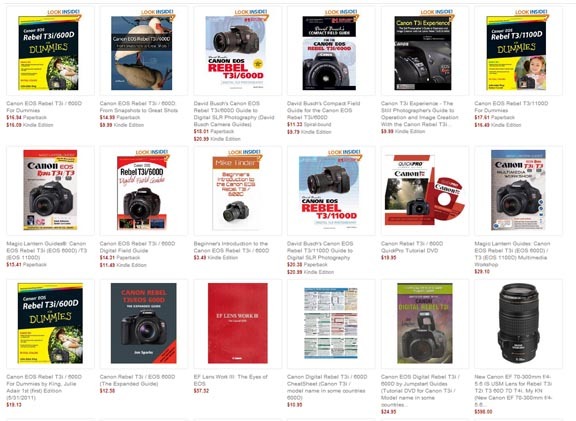 The best books on the cameras give you several ways to use them. Just like the Canon t3i Manual, a good guide book should give you ways to get a quick answer to a question as well as a way to explore a subject in depth. The good camera guides and book are more real-world and practical and provide sample photographs that do a good job of illustrating how a setting or a feature of the camera should be used. Yes, a complete guide should explain the buttons, dials, and menus. It should also give you the reasons behind using a setting in certain situation. The photo below is of a screen shot from the Barnes and Noble web site. You can learn a lot about a book by reading the reviews written by other buyers. The shortfall comes along if the number of reviewers is small. 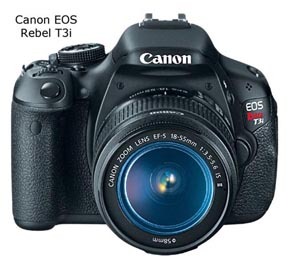 As an example the Rebel T3i/600D earns a five-star rating, but it was only reviewed by one buyer on the Barnes and Noble web site. That same book was reviewed by 78 buyers on amazon. Basing your decision on which book to buy shouldn't be based on just one review. It is often helpful to read several of the low-rating reviews to get an idea of whether the book might be disappointing in a certain aspect. 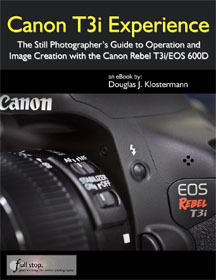 In addition to t3i books and the t3i manual, other useful Canon t3i tips can be found on the "dummies" page: www.dummies.com.